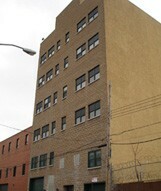 LOCATION: 37-31 10TH STREET, LONG ISLAND CITY N.Y. Comments: Divisions are available from 2,000 - 16,000 square feet. The building has underground parking for 16 cars ($200.00 per spot per month). Each tenant is responsible for their prorated share of real estate taxes and maintenance fees.